One of the most outstanding hockey players never to have played in the National Hockey League, Soviet superstar Valeri Kharlamov was an internationally-acclaimed forward whose exceptional skills garnered much of the hockey spotlight during the legendary Summit Series against Canada in 1972. 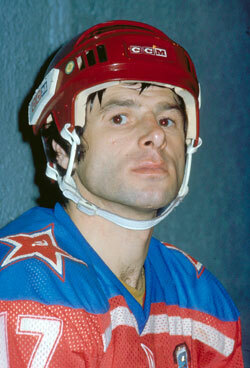 Valeri Borisovich Kharlamov was born in Moscow, USSR on January 14, 1948. His hockey talent was recognized as a youngster, and by the age of fourteen, he was admitted to the Children and Youth Sports School of the CSKA Hockey Club. Closely monitored, Valeri was just twenty when he joined the Soviet Union's national team. In 1968-69, the impressive forward scored 37 goals in 42 games for CSKA Moscow of the Soviet Elite League. The next season, he fired 33 markers in 33 games.in the Russia. 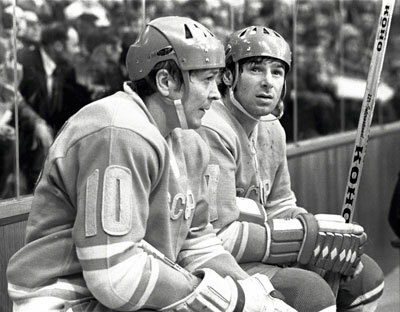 By 1971, Kharlamov led the league in goals with 40 and earned all-star recognition. To no one's surprise, Kharlamov was selected to represent his country at the 1972 Olympic Winter Games in Sapporo, Japan. On February 13, the Soviet Union defeated Czechoslovakia 5-2 to capture the gold medal. 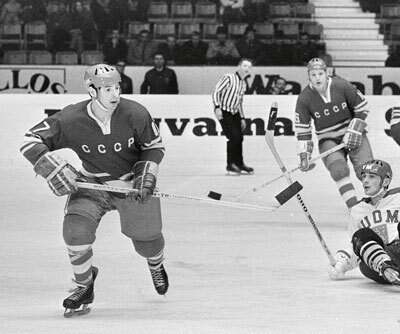 The USSR failed to lose during the tournament, winning four and tying one during the five-game series. Kharlamov led the Olympics in scoring, collecting 9 goals and 6 assists during those five games. Returning to his league team, Valeri won the scoring championship with 40 points and was awarded the most valuable player honour. During September, an eight-game series was created that would, for the first time, pit the Soviets best against Canada's best. Any previous meeting between the two hockey powers had the finest USSR players facing the best amateur Canadian players, but in the Summit Series, NHL players were permitted to play. The series was intense, and the first four games, all played in Canada, left the Canadians reeling. What most pundits believed was going to be a rout in favour of the Canadians saw the Soviets win Game One by a 7-3 romp, Canada top the USSR 4-1 in Game Two, the two squads tying 4-4 in Game Three and the Soviets edge Canada 5-3 in Game Four. The teams played the next four games in Moscow, and the Soviets won Game 5 by a 5-4 score. Canada rebounded with a 3-2 win in Game Six, and 4-3 in Game Seven in a game that Kharlamov missed due to injury. Valeri returned nursing a cracked bone in his ankle, but in what many consider the most important game in Canadian hockey history, Canada pulled out a 6-5 victory in the eighth and deciding game. In spite of being checked closely, missing a game and playing the final game with a broken ankle, Kharlamov finished the series with 3 goals and 4 assists, his 7 points fifth best in the tournament. Having been noticed by NHL scouts, several teams tried to secure Valeri's talent, but at that time, Soviet players were unable to leave the country to play in North America. Staying with CSKA, Kharlamov won a second straight MVP award with a 32-point season. 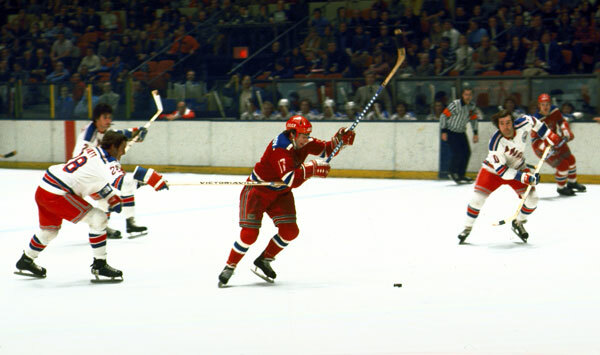 During his thirteen seasons with CSKA, beginning in 1967-68 and concluding in 1980-81, Valeri Kharlamov scored 273 goals, added 196 assists and totalled 469 points in 401 games. During that time, he was selected as an all-star seven times. During that period, Valeri continued to represent his count at the World Championships. The Soviet Union took the gold medal in 1973, 1974, 1975 and 1976, led by the superb Kharlamov. He was named an all-star at the World Championships in 1972, 1973, 1975 and 1976, and during the latter tournament, was also named the best forward. At the 1976 Winter Olympics in Innsbruck, Austria, the Soviet Union again won the gold medal, defeating Czechoslovakia 4-3 in the deciding contest on February 14. Kharlamov once again starred for the USSR, scoring 3 goals and 9 points in five games. In 1998, Valeri Kharlamov was recognized on the Internationasl Ice Hockey Federation's Wall of Honour. In 2005, he was posthumously inducted into the Hockey Hall of Fame. His son, Alexander, accepted the honour on behalf of his father. "I want to say 'thank you' for selecting my father into the Hockey Hall of Fame. It's a big day for me. Thank you for remembering my father." Kharlamov is commemorated in several other manners. The Kontinental Hockey League has a Kharlamov division and the best Russian player in the NHL, as selected by all Russian players, is presented with the Kharlamov Trophy. Young Russian stars revere the memory of the explosive star. Ilya Kovalchuk of the Atlanta Thrashers wears Kharlamov's number 17, while the Pittsburgh Penguins' Evgeni Malkin wears number 71, the reverse of Kharlamov's legendary number, in honour of the late star from his homeland. 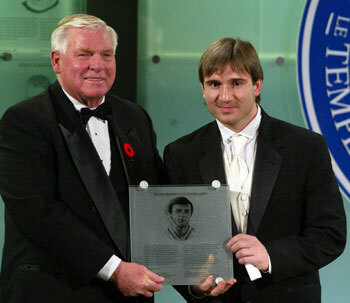 "I remember Valeri as a remarkable man with a strong personality," stated teammate Vladislav Tretiak. "Whenever he came out on the ice, his opponents never knew what he was going to do the next moment. Everything he did looked so easy, so elegant. There'll never be a hockey player who could match his achievements. People like (Valeri) Kharlamov are born once in a century." Kevin Shea is the Editor of Publications and Online Features at the Hockey Hall of Fame.